Creation magazine is the world's leading creationist publication, published by Creation Ministries International in Australia, and with an editorial team comprising Dr Don Batten, Dr David Catchpoole, Dr Jonathan Sarfati, and Dr Tasman Walker. Each issue includes reader feedback, a "Focus" section with reports of news items relevant to creation, a four-page children's section, and an interview with a creationary scientist, along with various other articles. 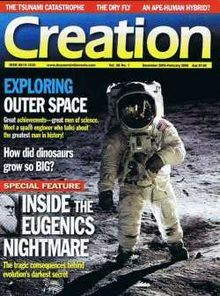 The magazine originally included technical articles, but a peer-reviewed journal, now titled the Journal of Creation, was begun to publish these, and Creation is now dedicated to publishing articles at a layman's level. The magazine is distributed mainly by subscription, but is also available in some Christian bookshops and selected newsagents in Australia. Subscriptions are available for purchase online or by contacting the various international CMI offices. It was also available from Answers in Genesis until 2005 after which they stopped distributing the magazine (and the Journal of Creation) in America and substituted their own new Answers magazine for the remainder of existing Creation subscriptions. Back issues are available for purchase at a greatly reduced savings. In addition, many of the articles from back issues are now available free on-line on the CMI web-site. A Finnish-language print version is also available. This is published less frequently by a Finnish creationist group, Luominen, and includes translations of selected articles from the English-language version. The magazine has varied its title since first being published, and had a short-lived alternative volume numbering. Typical of volunteer and small publications, in its early years publication was erratic, but it has long since settled down to a regular and reliable schedule. Digital subscriptions were made available from 2013. Ex Nihilo 1981 vol. 4, Nos. 1 to 3 Three issues (March, June, and October) Vol. 4 No. 2 was the first with a full-color cover and printed on glossy paper. Creation Ex Nihilo 1986—2001 vol. 7 No. 4 to vol. 23 No. 2 Four issues each year (March, June, September, and December), with each volume starting with the December issue. Creation 2001—2009 vol. 23 No. 3 to vol. 31 No. 4 Four issues each year, as before. Creation 2010— vol. 32 No. 1— Four issues each year (January, April, July, and October), with each volume starting with the January issue. For a very short time (no more than the six issues shown below), the magazine was given a dual numbering system, presumably coinciding with expanding distribution of the magazine into the American market. This page was last modified on 23 April 2015, at 16:52.